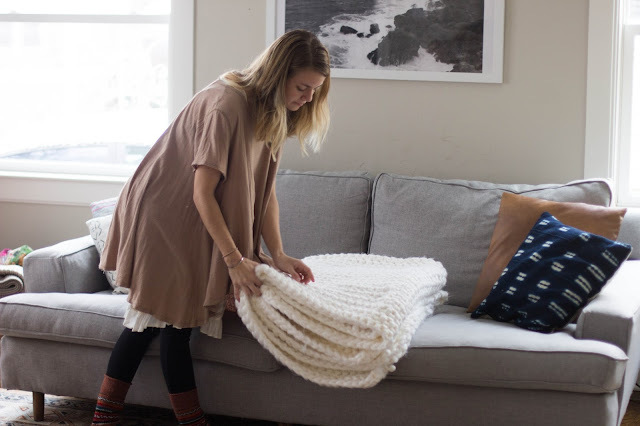 Pull out that crochet hook you've got stashed away because I'm about to show you how to make the easiest, coziest, most rewarding blanket…ever. It snowed today and I am so glad I have this blanket to cozy up with for these winter months! process: chain 86 (or until desired width), *single crochet in second chain from the hook, single crochet across, chain one* and repeat from asterisks until the desired width you want. my method & notes: Don't know how to crochet? Here is how to chain, single crochet and if you prefer to make your blanket go a little faster with a taller stitch, you can use double crochet instead! I ended up using 13 balls of 100yd Loops & Threads Ginormous yarn that I bought during a half off sale at Michaels and can't seem to find for sale on their website. Check out their stores for availability, it is JUST like the "similar" I linked above but comes with way more per skein. My blanket ended up measuring 56inx85in. It is very heavy, but extremely warm! I crocheted this over a period of about 3 days, a few hours here and there while binge watching Making A Murderer on Netflix. As you can see, it is rather large and chunky and just all around cozy goodness. The key to a good chunky blanket is the yarn. I am so glad I found this yarn at my local Michaels! Hopefully one day I'll knit an even chunkier when I get up the nerve to order some roving online. 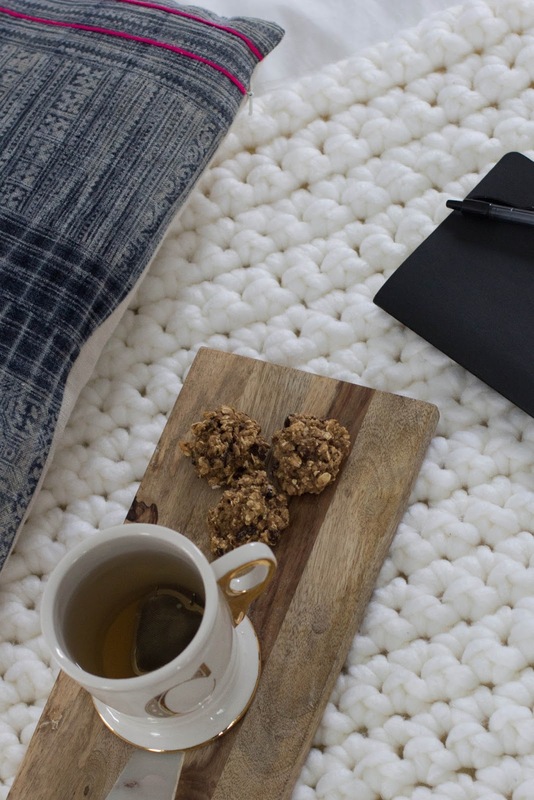 Have you been crocheting or knitting anything lately? Here is where to find chunky yarn! **Thanks to, Rachel Andersen for these photos! What a cozy blanket! How many skeins did you use? I used 13 skeins of 100yd yarn! question for you- michaels only sells skeins of 27 yards not 100 yards- where did you find the 100 yard skeins? They were for sale at Michaels last year. Try looking this winter. Just wanted to let everyone know, michaels has the ginormous yarn in stock at my local store in Michigan. This is the first i have seen it since last year. The skeins are 84 yards each and sell for 9.99. I was able to use their 50% off digital coupon over the course of a few days. Ginourmous yarn is on sale at Michael's for $5.99. I bought some Saturday in Highland Indiana. How fun! I'm definitely going to try to make one of these! Ooh can't wait to see, Sarah! I love this! Definitely want to try making one! Thanks for the link for the yarn. Acrylic seems like a great choice for a project like this due to washability - and price! You should try roving! It's not so daunting. :) I really like Knitpick's and Dharma Trading for roving sources. I took a deep dive into knitting with roving over the last few months and it is totally delightful. If you do order some, I have a tutorial on my site about my process of splitting it and "spinning" it to make it more manageable to knit. Given your abundance of creativity, I'm sure you can do amazing things with it! I'm heading over to check it out right now, thanks for easing my mind! I am probably just making it out to be a bigger deal than it really is! So pretty. Makes me want to start crocheting agai . Hmmmmm. Thans for sharing! 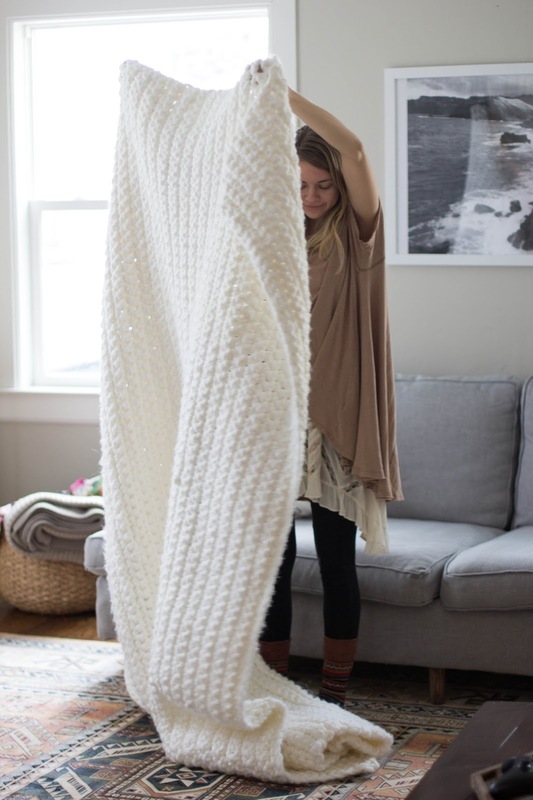 This would be the perfect project to jump into crocheting with! Love this but love your outfit even more. Where did you get it? Well thank you, Sandra! The tops I am wearing are both from Free People! This needs to have a style post of it's own with links :)!! The top is called Circle In the Sand Tee if you ever come across one! WOW! What a beautiful blanket! Looks so so cozy! I think I need to learn how to crochet! It is so cozy! I've enjoyed it during these winter months. I think you need to learn to crochet too, Shy! this is beautiful.I'd have to use a darker color white dons't work well with two kids in the house. I'm making a temperature blanket at the moment along with other things. isn't roving very easy to tear though? I bought one ball once and it broke so easily i took it back for something sturdier to use. I was on the fence between white and gray, so I think a darker color would be a fantastic choice! I didn't know that about roving, I will have to look into it! Where is the blue printed pillow (in the pics with the coffee cup) from? It looks like it's Hmong batik fabric. Hi! It is from https://www.etsy.com/shop/maewoven! I highly recommend it! Hi Shelly, it is noted under "process" in the post above. You may need a few crocheting skills, but it is easy enough that the beginner crocheter can take it on! Hi! I would definitely suggest watching the how-to stitch videos. You will need to know a few basics in crocheting but only the basics for this tutorial! 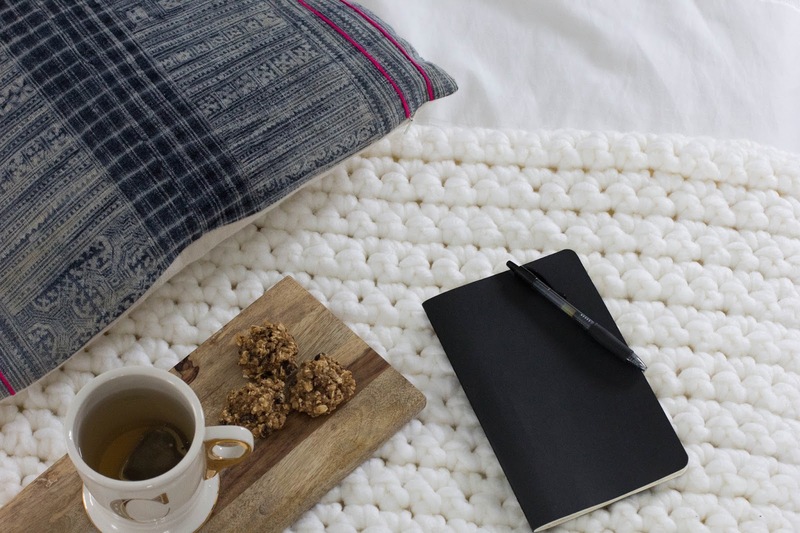 Once you get a grip on how to chain and single crochet you can make this blanket easily. I used Loops & Threads Ginormous Yarn! A VERY similar yarn is Loops & Threads chunky yarn! Does the chain of 86 make the 85" side? I can knit but don't know how to crochet. This looks like the perfect starter project! Yes it does, you chain 86 because at the end of each row you'll chain one extra chain so that you can start the next row without making the sides shorter and shorter each time. Hope this helps! 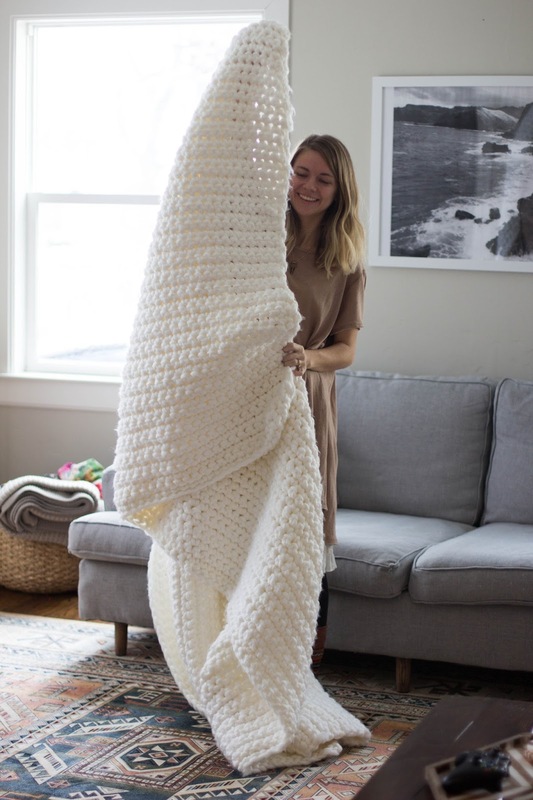 I just found this from roaming pinterest and this blanket is EXACTLY what I have been looking for. The downside is that I have no idea how to crochet. Is there a video or tutorial somewhere that you learned from? Thanks so much for pointing that out! I fixed all the links and added the single crochet stitch video in the "process" portion! I am so glad this is what you are looking for, this will DEFINITELY warm you up- even while you are making it! The videos above should help you figure out crocheting in no time! Did you single or double crochet? Single! I just linked to a single crochet video! So I am very new to crochet - crocheting; and I loved this blanket. I'm in the process of making mine now, however I have the tendency to crochet too tight, or so my boyfriend says (he used to crochet when he was younger and bought me everything is need to get started this past Christmas). I'm using a pretty thick yarn and I keep having to go down a size in my needles every row I do, mind you I'm only on my fifth row, but I like the tight look of it. I can say though that my hands are killlllinnggg me. Any suggestions as to how I can keep it still looking tight but not ruining my hands or having to go down needle sizes? I would say when you wrap the yarn around the needle, make sure it is tight but keep a loose grip on your needle. You don't have to grip it like a pen or pencil, you can have it relaxed in your hand - this shouldn't determine how tight it is! Just keep practicing relaxing your hand! Could you make this with loops and thread charisma yarn? Would you need a smaller hook as well? 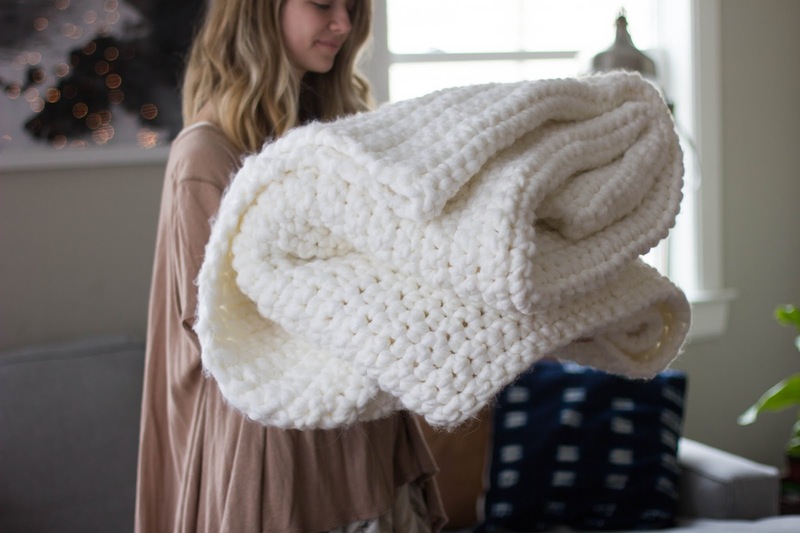 You can make this with any yarn you choose! To make it chunky and thick just make sure you use a thick yarn. You can find on each yarn skein the size of hook you should use. It will be listed on the back! Hey! So I'm in the middle of making my blanket (I'm so excited I finally found a pattern I think I can handle since I'm a beginner) I've used about 6 balls and I only have about 5 rows on my blanket. I'm following your steps, materials and all. How many rows would 1 ball of yarn yield for you? Any suggestions ? Am I crocheting too loose? Are you using the yarn with 100yds? 100yds should get you about 5 rows each! They don't sell that at my Michael's either. I can't even find it for sale online. It's getting expensive to make one with these 27 yard balls. I'm guessing the yarn I used was seasonal, because I got it around the holidays at Michaels! My Michaels still has a few balls left on clearance. Maybe just call around? Could you tell me what is the content of the yarn you use, is it 100% acrylic? Hi. The blanket pictured is chained 86? I really like the size of it, but it looks like more than 86. I don't work with chunky yarn very often though. Thank you! It is 86, but the instructions say to just go until you find the length you like! Awesome blanket! I guess you could say I'm an intermediate crocheter. 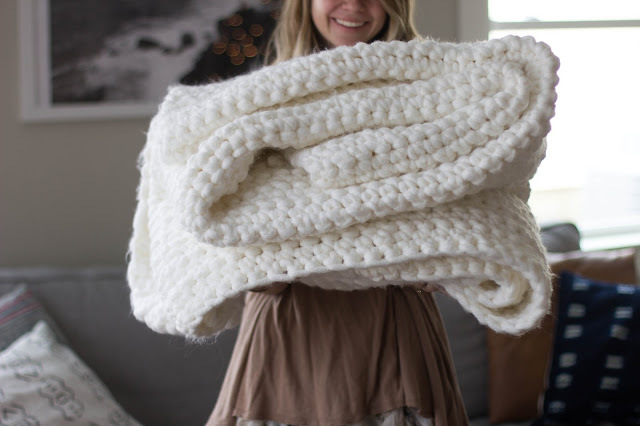 My daughter came across a super chunky blanket that she fell in love with but it was premade and the cost was astronomical! So knowing that I crochet, she asked me if I could make it. Well at the time, this yarn was nowhere to be found or bought (or at least where it was sold in the US in skeins). So finally Michael's started selling it but by the time I became aware of it, the color selection and amount of it in stock in the store was minimal. I was only able to get 4 skeins of the Loops & Thread Ginormous yarn in the color she wanted. Now trying to find a pattern for a blanket that's bigger than the usual throw blanket size has been really difficult to find! When I bought the yarn there was also a rack next to the yarn for US 50/25 mm crochet hook. So here I am with 4 skeins, a hook and no pattern for the amount of yarn I have! If anyone has any recommendations, I would greatly appreciate them! It is crazy how fast 4 skeins can go…especially when trying to crochet a blanket. Maybe try a super chunky scarf?! Try the V stitch. Its a little more airy and could go farther. Or call other Michaels. Or maybe pick up other colors - color block blanket! Love love love the blanket...and your outfit...and your rug!? Where did you get it? 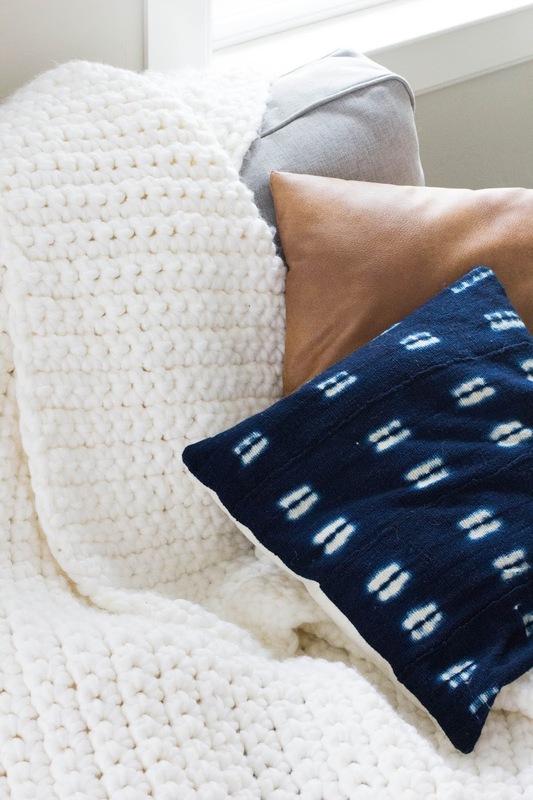 We have a grey couch just like yours and I'm always in search of a funky rug with an aztec vibe! Thanks! Thanks so much! I got the rug at RugsUSA! I love your rug too! Do you remember the name? Hey there! Do you think if I tried to chain 70'ish and using the same amount of wool, it might be a bit more square? 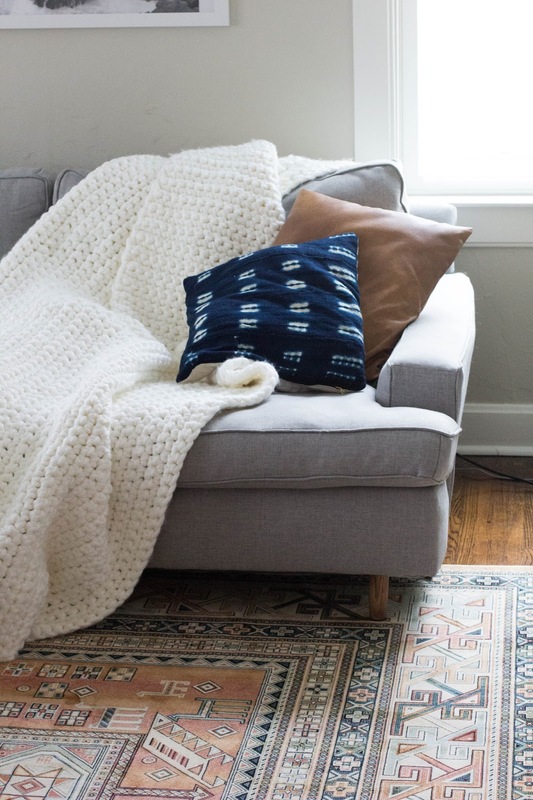 I love love the blanket but I think for my house, I'd like a bit closer to a square than a rectangle. Appreciate your feedback! Yes! Whatever length you chain, you can customize it to what size you want! I used the Ginormous yarn by Loops & Threads. I can not find the link anywhere online but I purchased it at Michaels! Love your blanket! I have the same yarn,and just started using it. I have a few questions. How is it holding up? Have you had to launder it, and did it stop shedding? Thanks! The blanket is holding up well! It unfortunately didn't stop shedding and I haven't laundered it yet. I just put it away last month for the warmer months. I'll take it out again in the fall and probably get it dry cleaned but I haven't looked into that yet! Let me know how your project turns out! Hi! I absolutely love this blanket.. I made a blanket last year as my first time ever and I finally want to get back into crocheting but since it's been some time I think this pattern would be perfect. Can you use the Bernat blanket yarn or is there a specific yarn weight or thickness that works best!? I bet the Bernat Blanket Yarn would work great, although I've never used it. I tried to use the chunkiest yarn I could find! It may be your hook...I would also try not pulling the sc tight, loosely hold the yarn and the hook. You should be able to easily slide the hook into the stitch. Hi! I'm a crocheting beginner; could you please explain in a little more detail the instructions between the asterisks? After you chain 86, what do you mean by single crochet IN SECOND CHAIN FROM THE HOOK? Also, please elaborate on single crochet across (across what?) and chaining one (is that just to move to the next row?) Thanks! I would spend some time practicing crochet patterns, but what I mean is you put the hook in the second chain away from the hook, not the one closest to you. You crochet across the blanket - so you stitch in the previous stitches you made. I love this Afghan, but using 13 skeins of aprx 100 yds ea at 9.99 a ball costs over 100 dollars to make. That is outrageous and not even worth the bother if you could even afford it. Like I said in my post, this blanket is an investment and something you need to decide for yourself if it's worth it. I will use this for years and years to come so I believe it was more than worth it. A blanket of this size and weight bought anywhere else would be $500+ so I believe it is well worth it. Hi - in the pattern it doesnt say if you need to chain any t reach your next row? on the tutorials I have seen it always says you chain 3 / 5 and then turn to start your next row? Just checking I dont need to do this on this pattern? thanks so much! Did you use one skein/strand at a time while you made this? Or did you combine multiple skeins/strands like a lot of chunky blanket patterns often do? Yes! I used one strand at a time! Thank you for this post - you inspired me to learn to crochet. I thought that if this was the only thing I ever made, then I would have what I want. I haven't stopped crocheting since! I still use my blanket, made with Lion Brand Thick & Quick. Wow! This is so encouraging to me, Kim! Thanks for sharing...I'm glad you've fallen in love with crochet! I have started the blanket and seem to have created a slight rainbow affect in that the blanket is laying curved. I daren't unpick due to cost of the wool I paid over here in the UK. Am into my third ball of wool. Any advice? I have started the blanket over here in the UK and am into my third ball of wool (expensive) so daren't unpick it. I have created a slightly curved shape so far. Maybe I have used too many sc in the beginning few rows but am counting correctly now. What should I do? It sounds like you have a few extra stitches in the middle or ends of your rows. Make sure you are only crocheting in one stitch and then moving on to the next stitch. I think you can unravel it and save your yarn and start over, or unravel it until you find the beginning of the "rainbow effect". 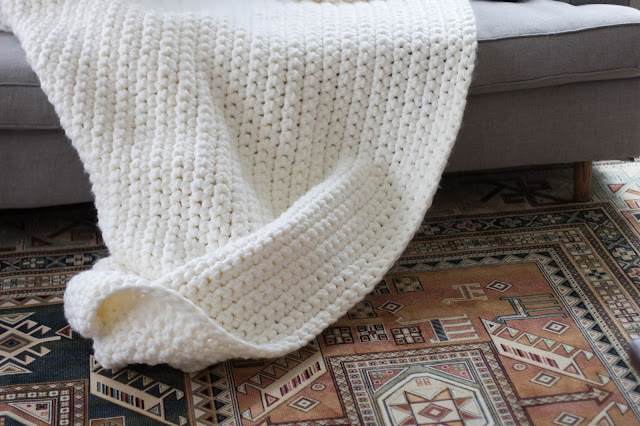 I love this blanket and can't wait to make my own. I want to do a gradient with several colors instead of just one, so I was wondering how many rows you ended up with using 13 balls? As I read what you wrote above, I also see this as an investment. I'm buying it 1 skein at a time, using 40-55% off regular item, that all the craft stores email out, to help save on the cost of the yarn. No one said I had to buy all the yarn at once 😊 Thank you for sharing this beautiful blanket pattern with us! Such a great idea, Betsy!! using 13 balls, I ended up with approximately 180 rows! I also got all my yarn during a big %)% off sale! great idea! Loving this blanket. Started making today. Any suggestions how you tied in the ends when you changed yarn so they don't show so much. Love your ideas. Keep sharing. For the ends, when switching to a new skein tie the yarn together using a strong knot and cut the ends close to the knot. Or you can leave the ends long and weave them in! Hope this helps! tried both ways- Its a little harder to weave ends in but they don't show as much. Thanks for advice. Just started doing this without any pattern and definitely see why aNY beginner would need some info about different aspects of crotcheting. I was using a triple crotchet to see if I could make a blanket with the yarn I bought (tons of the ginormous yarn mentioned here). This post is the perfect solution to what I needed...I was adding crotchets at the ends so it was growing every row! This is a gods send, thanks! I'm so glad it was helpful! Thanks for sharing, Araceli! Starting the second blanket. Turned out beautiful. Grown kids love it so more to make. It is a little costly and I did buy the yarn in two orders from Michaels. I used the 27yd skeins as unable to get the 100 yd. skeins. Plan on about 32 balls of 27yd skeins per blanket if you go this way. FUN TO MAKE- I just single crocheted. I am only seeing Loops and Threads Chucky yarn. Is that the same? On my 6th blanket now. Using BERNAT Mega Bulky 10.5oz/300g size 7 with a size S19 hook. I love the feel of the yarn (100 acrylic). It's a bit costly but I always try to buy the yarn at sale time and all at the same time so I don't run out. Heirlooms for grown kids! Definitely going to make this for my mother in law for Christmas. She loves Knitting, but I have a feeling she's going to love this! This blanket is amazing! I fell in love with it the moment I saw this and ordered the yarn the following day. It is super easy and just love the pattern. Anyone who sees me making it tells me how beautiful it is. Thank you so much for sharing your post. Once I'm done with this one, i think i will try double stitching since this was my first crocheting project. I am so inspired to start crocheting! Do you have any other chunky yarn brands you suggest?